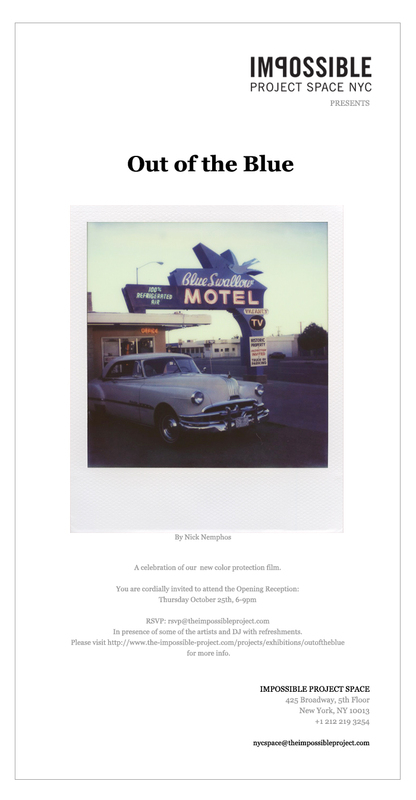 Thursday October 25th, the “Out of the Blue” exhibit is opening at the Impossible Project New York gallery space! I was chosen, along with 29 other talented photographers, to display our images celebrating what’s become possible with Impossible’s newest films. I’m grateful and honored to have been selected with the likes of such creative individuals! If you are in the New York area, please stop by and check it out. Not just for the unique images on display, but also to meet the incredible people that work there. The exhibit will be up for roughly 3 months, until Jan 31st, so you’ve got plenty of time!